and HMI control. Also, in conjunction with Pryer Technology Group, the firm will exhibit the new 500-ton Triform sheet-hydroforming press Model 16-5BD, and its latest DJ benchtop presses. 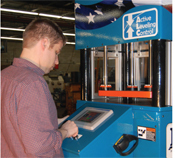 A special focus will be on presses for compression molding, as well as off-center loading capabilities. Along with showcasing its variety of hydraulic and hydroforming presses, the company will display a bevy of drawn parts.